PUSH the BOUNDARIES of HORROR to the Edge of the UNIVERSE! New kinds of horror await you: ones torn from the bodies of the dead, born in the minds of the mad, travelled from depths of space and even intrusion from other dimensions of nightmares made manifest! Choose from a wide variety of character paradigms, even use yourself as a template to create immediate immersion! Fluid character advancements and lots of tactical options that utilise unique party roles! Fully customizable gear options to make any futuristic weapon, armour or device your imagination can devise! Players generate "Risk" for GMs, used to unleash an enormous catalogue of hazards and opponent upgrades to keep your players on their toes! 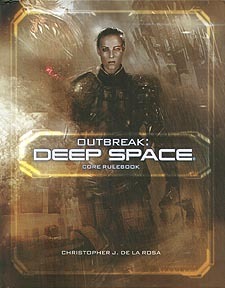 Run single sessions of survival horror or a sweeping campaign of discovery and political intrigue. Build dread slowly or run action-adventure games! Each terror has their unique catalogue of dangerous opponents, Hazards and Missions with plenty of crossover potential!